Learn how to make an app to share photos with your Facebook friends, using Parse to easily create a back end for your app. Parse is a service you can provide to easily make web backends for your apps. 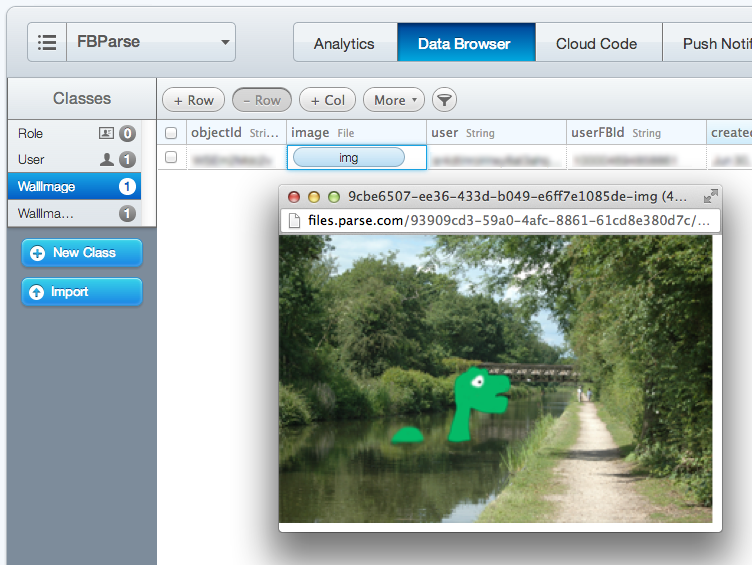 In our previous Parse tutorial, you learned how to use it to create a simple photo sharing app. 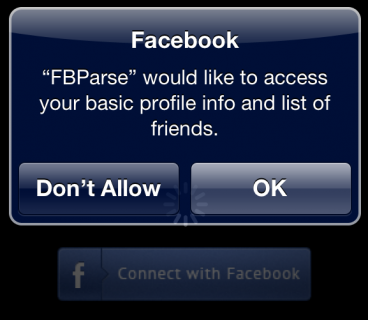 Recently, Parse was acquired by Facebook. One of the benefits of this is that integrating apps made with Parse with Facebook is now easier than ever – and that is the subject of this tutorial! In this tutorial, you will be Facebookifying (okay, I admit I made up that word!) the same type of photo sharing app you built in our previous Parse tutorial. Your app will allow users to upload their images to Parse, and in turn, see a wall of images uploaded by the user and their friends. Comments are open on all of the images on the wall — which should provide a steady stream of insults witty banter! In Part 1 (you are here! ), you will learn how how to set up a project with Facebook and Parse SDKs, authenticate a user with Facebook using Parse’s Facebook toolkit and retrieve Facebook user information using the Facebook Graph API. In Part 2, you’ll build a data store for your images and comments in Parse, display uploaded images on an image wall and add a comment system to your app. So without further delay, read on to get started building your three new apps! Yes, three new apps! You’ll need one Facebook app, one Parse app, and an iOS app to pull it all together. So that means before you can set down any code, you’ll need a verified Facebook account, as well as a Parse account. You can optionally provide an App Category for your app, but it’s not mandatory. Click Continue, proceed through the security check, and you’ll be rewarded with your shiny new Facebook app. If everything looks good, click Save Changes and your Facebook app is ready to use. Don’t lose this ID — you’ll need it later on in this tutorial. 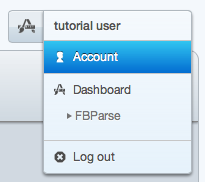 That’s it for Facebook; you can now set up your Parse application. Once you’ve done that, you’ll be presented with the Parse welcome page. Note: If you already have a Parse account, just go to your Dashboard, select Create New App and follow the prompts to create a new app. Find the Application ID and Client Key for your app; copy these to a text editor and save them in a convenient location. 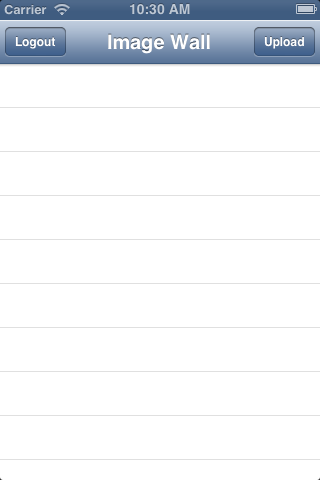 You’ll use these later to link your iOS app with Parse. The Parse setup is complete — everything else you need to do takes place in the iOS app. So that you can concentrate on Facebook and Parse, download the starter project here. The starter project provides a storyboard and all the UI elements you’ll need. 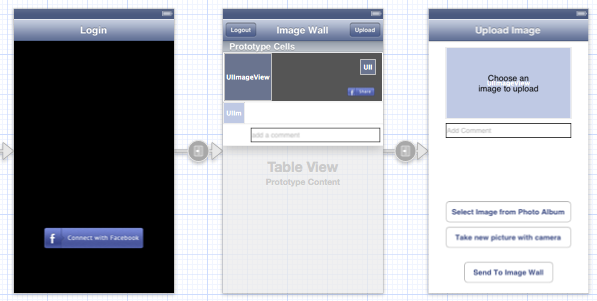 Note:If you are unfamiliar with the use of storyboards, take a look at Beginning Storyboards in iOS 5. Open up the starter project in Xcode and build and run. You’ll see a Login screen, but since you haven’t yet integrated Parse with your app, it won’t do much at this point. Login: Provides a mechanism to log in to the app using Facebook authentication. Image Wall: Displays the images the user and their Facebook friends have uploaded along with comments on the images. Image Upload: Uploads images along with their comments. A section header cell showing the image, who uploaded it, and a timestamp. A comment cell, to show all the comments for that image. A cell providing a text field to submit a new comment. The view controller segues are simple push segues. In order to use Facebook and Parse in your app, you will need to include the appropriate SDKs in your build. 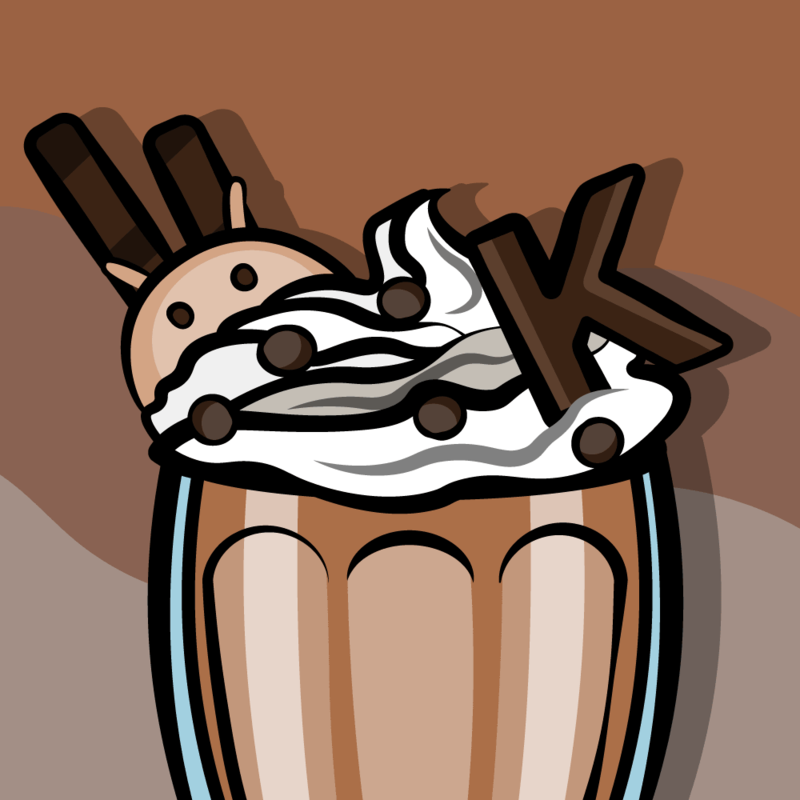 Head over to http://developers.facebook.com/ios/ and select Download the latest SDK. Install the downloaded package; the SDK will be installed in ~/Documents/FacebookSDK by default. In Finder, drag the FacebookSDK.framework folder from the SDK installation folder into the Frameworks section of your project in Xcode. Choose Create groups for any added folders and deselect Copy items into destination group’s folder (if needed) to keep the reference to the SDK installation folder, rather than creating a copy. 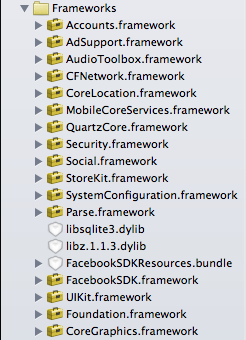 Now drag the FBUserSettingsViewResources.bundle file from FacebookSDK.framework/Resources into the Frameworks section of your project in Xcode. As before, choose Create groups for any added folders and deselect Copy items into destination group’s folder (if needed). 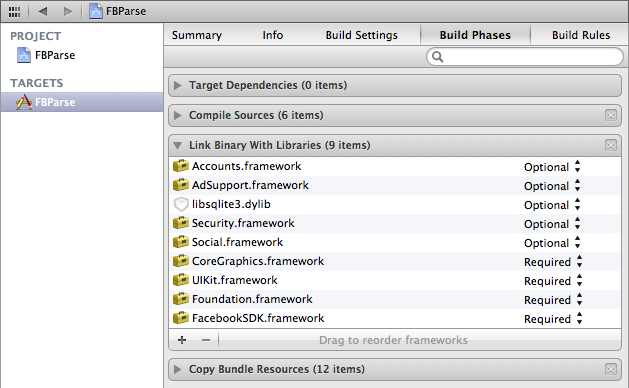 To add these, go to the Link Binary With Libraries section of the Build Phases for the FBParse target in your project. Add the Frameworks and Libraries as Optional, rather than Required, so that your app supports devices running iOS 5 as well as iOS 6. Remember that Facebook App ID you captured earlier? (You did save it somewhere, didn’t you?) It’s time to put that to use in your project. FacebookAppID as a string value containing the Facebook App ID you stored safely away early in the tutorial. FacebookDisplayName as a string value containing the display name you set up previously when creating your Facebook app. URL types as a single array sub-item named URL Schemes, which contains your Facebook App ID prefixed with fb. This value is used when handling callbacks from the Facebook web dialogs, should the Login not be handled natively by iOS. Build and run your project to ensure you have no compilation issues with the Facebook SDK and the included Frameworks and Libraries. 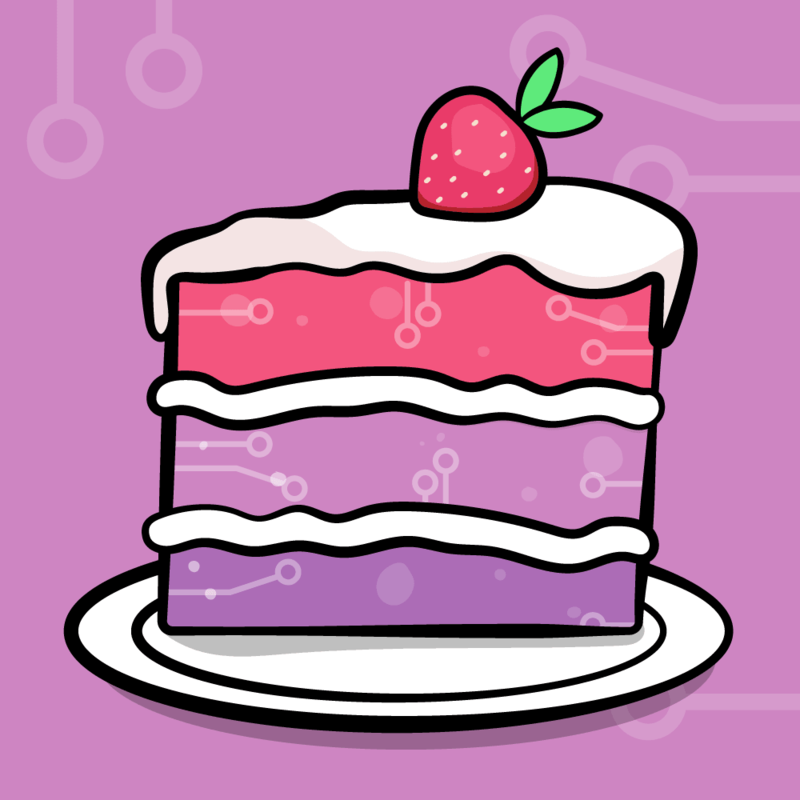 That takes care of Facebook — now it’s time to integrate Parse into your app. 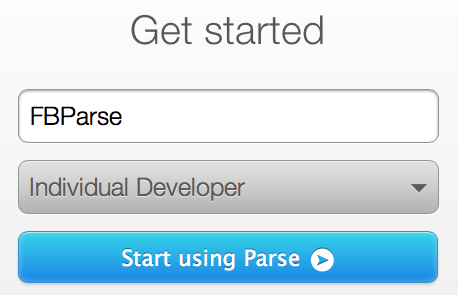 Head over to http://www.parse.com/docs/downloads and download the Parse iOS SDK. 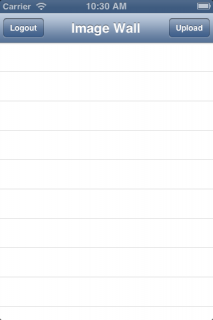 In Finder, locate Parse.framework and drag it into the Frameworks section of your project. Build and run once more to confirm that you have no compilation issues with all the included SDKs, Frameworks and Libraries. The app still doesn’t do much of anything — don’t worry, you’ll see some visible progress soon! That was a lot of prerequisite work, but you came through with flying colors. Now it’s time to work on the code of your app. // Register our Parse Application. // Initialize Parse's Facebook Utilities singleton. This uses the FacebookAppID we specified in our App bundle's plist. Be sure to replace the placeholder keys here with your actual Parse Application ID and Client Key that you got earlier when creating the app in Parse. The above code informs your app of the existence of your Parse app and initializes the the Facebook features built in to the Parse SDK. These methods are required for your app to handle the URL callbacks that are part of OAuth authentication. You simply call a helper method in PDFFacebookUtils and it takes care of the rest. Build and run your app to confirm there are no compilation issues – your app is now linked to your Parse app! You’ve seen the Login screen a few times now and you’re probably itching to make it do something useful. Here’s your chance. To keep all of the communications code in a convenient place, you’ll put the login code into a new Comms class. This class will have static methods for all of your calls to Parse and Facebook. Create a new Objective-C class with a subclass of NSObject in your project and name the class Comms. The Comms class has a single method so far: login:. When you call this method, you will pass an object that implements the CommsDelegate protocol. When the login completes, the Comms class will call the commsDidLogin: method on the delegate object. // Was login successful ? The code above uses Parse’s Facebook Utils to login to Parse using Facebook credentials. You don’t need to ask for any specific Facebook permissions because the basic user information and list of friends is part of the default permissions. The code then calls the delegate method to inform the calling object of the success or failure of the logon attempt. The methods in your Comms class should to be accessible from anywhere in the app, so it makes sense to put the Comms class header import into the pre-compile. The method is referenced in your storyboard, to the touch-up-inside event on the Facebook login button. When the button is pressed, you disable the Facebook login button so that you don’t get any trigger-happy users attempts to hit the button multiple times. Next, you display an activity indicator to inform the user that something is happening behind the scenes. Finally, you call your new login: method that you added to the Comms class. The only thing left to do is make FBLoginViewController conform to the CommsDelegate protocol so that it can be informed about Comms actions. // Did we login successfully ? message:@"Facebook Login failed. Please try again"
The above method is your callback from the Comms class. First, the method does a bit of cleanup by re-enabling the Login button and hiding the activity indicator. Then, on a successful login, it performs a segue to the next view controller. However, if the login attempt failed, it displays an alert to the user. FBParse[1727:907] User signed up and logged in through Facebook! The Parse PFFacebookUtils class makes use of the three Facebook authentication methods available on iOS devices. First, it tries to use the native Facebook app. If the Facebook app is not installed on the device, it attempts to use the Facebook account set up in the operating system on iOS 6 and above. Finally, if neither of these options are available, it falls back on the basic Facebook web dialogs. Now that you can log into the app, take a moment to browse through the various views. The Upload navigation item takes you to the Upload screen – but this doesn’t work yet. The Logout navigation item takes you back to the login screen. Hmm, that’s not really what you want to do, is it? Currently, tapping the Logout button simply pops the Image Wall view controller from the navigation stack. You’ll need to implement the calls to log the user out of Parse. Hey — that was much easier than expected. 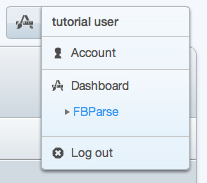 This is the only method you need to call to clean up your user on Parse and log out of Facebook. Ordinarily, you would allow PFUser to persist between launches of the app so that the app would automatically log the user in when the app starts. However, since the login is an important part of this tutorial, you’ll need to call logOut as well when the app loads. Build and run again; log in to the app as before and click Logout and you will return to the Login screen. When you run the app again, you’ll be prompted to re-login, since logOut was called when the main view was loaded. Your app now logs in and out of Facebook properly; now it’s time to upload some images. 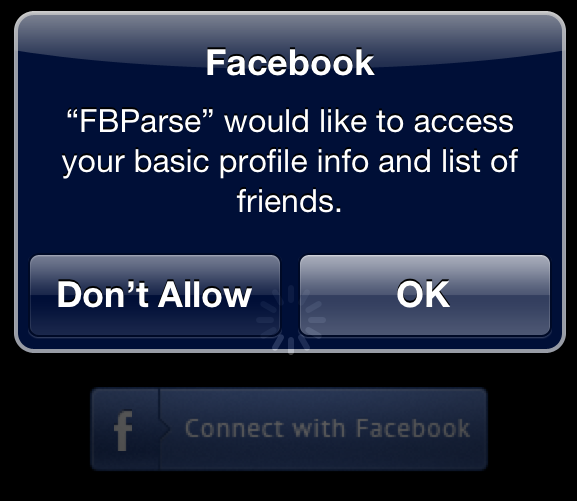 In order to share an image with your friends, Parse needs to associate your Facebook ID with your Parse User. This way, if you have a list of Facebook IDs of friends, you can find the Parse Users to share the image with. Unfortunately, when Parse stores the logged-in user in its Users table, it doesn’t store the Facebook user ID as a field; instead, it stores Facebook authentication data as an object. So you’ll have to put the user data into the model yourself. The code above sends a request to Facebook for all of the user’s details including their Facebook id. If no error is received from the request, then take the FBGraphUser from the returned object and get the value of the Facebook user ID stored in the me.id element. [PFUser currentUser] provides you with the currently logged-in Parse user. You then add the Facebook ID to the current user’s dictionary of fields and issue a saveInBackground command on the PFUser object. Your Parse app now has all the information about the logged-in user — including the user’s Facebook ID — needed to run future queries. Build and run the app, and log in as usual. To check that it worked, go to http://parse.com in your browser and choose your app name under the Dashboard entry in the drop down menu in the top right hand corner. Leave this browser page open as you will return to this page shortly to view your uploaded images. On a recent Sunday afternoon stroll, you were surprised to learn that the Loch Ness Monster was alive and well and living in a nearby stretch of canal. You jumped at the chance to snap this once in a lifetime photo, and now you can’t wait to share this experience with your Facebook friends through your new app. Parse provides you with an upload progress callback as your image uploads. You need to pass this on to the delegate using commsUploadImageProgress: so that your app can display the upload progress to the user. Once the upload is complete, you call commsUploadImageComplete: so that the delegate knows the image upload is complete. Get the image data for uploading. Convert the image data into a Parse file type PFFile and save the file asynchronously. If the save was successful, create a new Parse object to contain the image and all the relevant data (the user’s name and Facebook user ID). The timestamp is saved automatically with the object when it is sent to Parse. Save this new object asynchronously. If the save was successful, save the comment in another new Parse object. Again, save the user’s name and Facebook user ID along with the comment string. Once this is all done, report success back to the delegate class. If there was an error saving the Wall Image Parse object, report the failure back to the delegate class. If there was an error saving the image to Parse, report the failure back to the delegate class. During the image upload, report progress back to the delegate class. Now you need to call your new upload method from the upload screen. You’ll notice when you add this method Xcode presents a warning. Can you figure out the source of the warning? The warning is gone, but before you test this, you need to handle those callbacks from the Comms class. // Did the upload work ? message:@"Error uploading image. Please try again." The code above resets the UI to be ready for the next image upload. 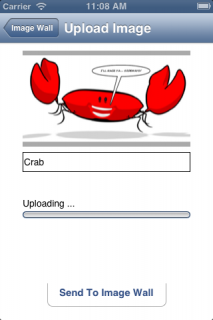 If the upload is successful, the view controller is popped and returns the user to the Image Wall screen. If the upload fails, the code alerts the user of the failure. The upload progress is displayed as a percentage, which fits nicely into the progress bar on the screen. 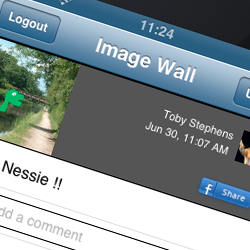 Build and run your project; select an image from the upload screen, add a comment and tap the Send To Image Wall button. Note:On the iPhone simulator, you won’t be able to take a picture with the camera for obvious reasons. You can use a device for this stage, but if that isn’t possible, then you will need to save some images to the simulator instead. You can either navigate to an image on the web using Mobile Safari, or simply drag and drop an image from Finder into the Simulator. Press and hold on the image in the simulator and you can then save it to the iOS simulator’s photo album. The image upload progress indicator will change as the image is uploaded; when the image is completely uploaded, the view controller is reset and popped and you will be returned to the Image Wall, safe in the knowledge that your images and comment are saved in your Parse app. Okay, so you need some proof that your images and comments made it to Parse. Since you haven’t actually coded the Image Wall yet, the only way to prove that your image is saved to Parse is to take a look at the Parse Data Browser. Here is the sample code which includes everything you have done up to this point in this tutorial. In Part 1 of this tutorial, you built an app that uses both the Facebook and Parse SDKs, added Facebook authentication using Parse’s Facebook Utils, and have successfully uploaded images to Parse. This knowledge gives you a good foundation to develop apps that use Facebook and Parse together. In Part 2 of this tutorial you will complete your app by fleshing out the Image Wall and allowing the user to create comments on friends’ images — and vice versa! If you want to learn more about the Parse SDK, check out the Parse iOS SDK reference. In particular, you might be interested in the documentation for the classes you’ve used so far – PFFacebookUtils, PFFile, and PFUser. 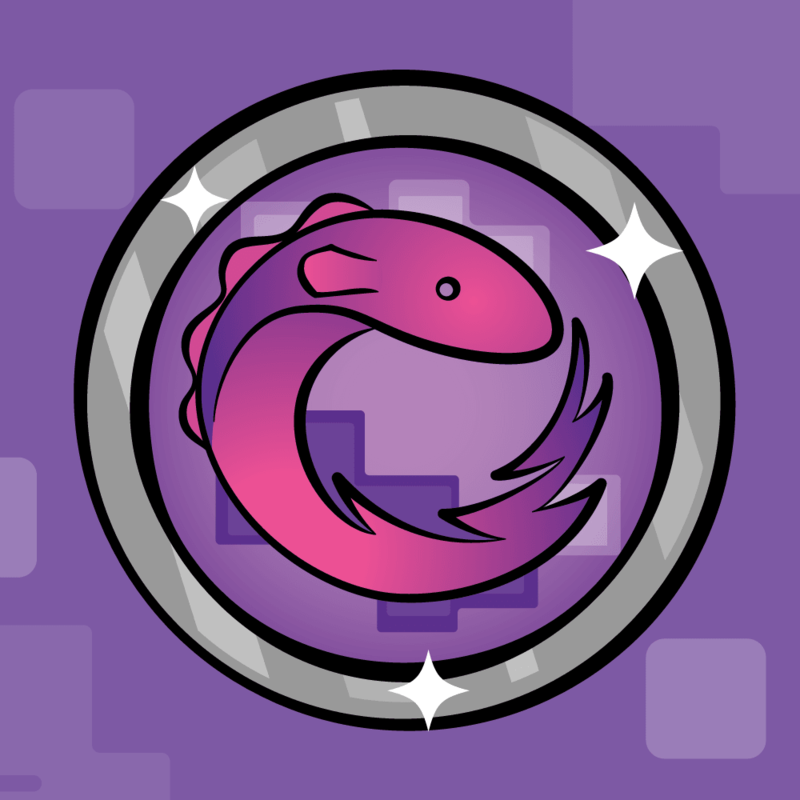 Please use the comments section below to ask any questions about the tutorial, integrating Facebook and/or Parse and with any suggestions for related tutorials going forward.